The French traveler Germon Blanky wrote the next on the Belogradchishki Skali in the far 1841: “Neither the famous narrow passes of Aulihul in Provance, neither the Pancarbo Gorge in Spain, neither the Alps, neither the Pyrenees, nor the most eminent Tyrol mountains in Switzerland have anything, which can be compared with what I saw in Bulgaria in the town of Belogradchik”. 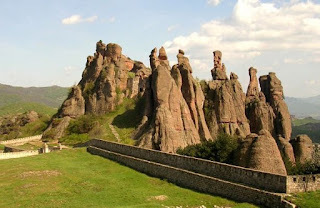 The known Felix Kanits appends: “It’s hardly probable that a more romantic fortress than the Belogradchik one has ever been built”. The region is one of the natural wonders of Bulgaria! 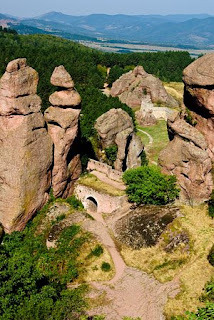 A fairytale stone world surrounds Belogradchik from west, south and southeast. If you come from Sofia by car you will see at first the Falkov-Borovets group of rocks with Momina Skala (Maiden’s Rock), Pchelin kamak, Torlaka, Borovishki Kamak and etc. Lipenitsa group is to the east of the town among which biggest interest evoke the Dinosaur and the Latin Kale (a strategic fortress surrounded by a fortified wall). It is worth seeing the Lepenishka Cave in which coaled wheat and watercrafts dating 2000 years ago were found, and the Izvozki oak - more than 1200 years old. 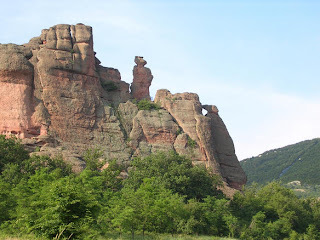 Among the Zbegovska group of rocks to the west of the town a great impression make the Twins, the rocks in the area called Magaza, Small and Big Zbeg, which were used as fortresses, the lonely obelisk Borich and the Belogradchik stone bridge. The primal group rises right away above the town. 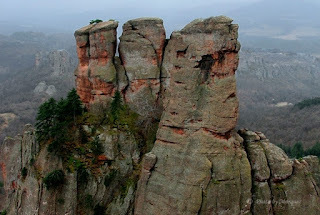 One can see about 100 m high lonely rocks named Adam and Eve, the delicate Madonna, Konika (The Rider), Uchenichkata (The Female Student), Mechkata (The Bear), the Dervish (Muslim clergyman), the impressive Borov Kamak, Mo-na-site (The Monks), the terrific kale with ancient fortress walls, above which the most magic rock wonders rise. I was in Bulgaria last year - in Byala. The beaches were beautiful but I did not know about those mountains. They were fantastic! September 1, 2009 at 10:21 PM This comment has been removed by a blog administrator.